This document is licensed under the Creative Commons Attribution-ShareAlike 3.0 Unported License. To view a copy of this license, visit http://creativecommons.org/licenses/by-sa/3.0/. This specification describes protocol that is used to distribute configuration to security servers of an X-Road installation. Additionally, the same protocol is used to distribute configuration between two federated X-Road instances. This protocol is based on HTTP and MIME protocols and supports refreshing the configuration meta-info without having to download the actual configuration files. The configuration parameters are distributed in XML format and described using XML Schema [XMLSCM1], [XMLSCM2]. This protocol builds on existing transport and message encoding mechanisms. Therefore, this specification does not cover the technical details and error conditions related to downloading information over HTTP and decoding MIME messages. These concerns are discussed in detail in their respective standards. The chapter 2 Protocol for Downloading Configuration as well as appendices Annex B, Annex C and Annex E of this specification contain normative information. All the other sections are informative in nature. All the references are normative. The following figure contains a class diagram that illustrates important concepts used in this specification. [XMLSCM1] XML Schema Part 1: Structures Second Edition, 2004. [XMLSCM2] XML Schema Part 2: Datatypes Second Edition, 2004. [X509] Internet X.509 Public Key Infrastructure Certificate and Certificate Revocation List (CRL) Profile, Internet Engineering Task Force, 2008. [MPREL] The MIME Multipart/Related Content-type, Internet Engineering Task Force, 1998. [XMLDSIG] XML Signature Syntax and Processing Version 2.0, 2013. [ISO8601] Data Elements and Interchange Formats – Information Interchange – Representation of Dates and Times, International Organization for Standardization, 2004. Configuration clients download configuration using HTTP protocol (HTTP GET). Configuration source signs the configuration to protect it against modification. The configuration clients receive (via out of band means) configuration anchor containing information needed to successfully download and verify the configuration. The configuration consists of a signed directory that references individual configuration parts. The signature has expiry date and thus the signed directory must be continuously refreshed by the configuration client. The clients can use the hash values contained in the directory to download the referenced configuration parts only when they are changed. Configuration anchor is used to distribute information about configuration sources to configuration clients. Because configuration anchor is used to verify authenticity of the downloaded configuration, it must be protected against modification. Example means are digitally signing the file or distributing the fingerprint of the file to the client in person. verificationCert – public key that can be used to verify the signed configuration, presented as X.509 [X509] certificate The certificate is only used as a container for the public key. The configuration client should not make any assumptions about other fields of the certificate. Annex A.2 contains an example configuration anchor file. Signature of the directory, created using private key of the configuration source. The signature is calculated over the body of the first MIME part. Signature-algorithm-id – the value MUST identify the signature algorithm used to create the signature. This specification supports algorithm identifiers listed in XML Signature specification [XMLDSIG], Section 6.4. Verification-certificate-hash – the hash of the certificate that was used to sign this configuration. The value of the header MUST also include parameter hash-algorithm-id whose value is the hash algorithm identifier used to calculate the verification certificate hash. The body of the signature part MUST be the value of the signature calculated using the signature algorithm identified in the Signature-algorithm-id header. The first entry in the directory MUST be a header-only entry with the header Expire-date that contains date and UTC time in ISO 8601 format [ISO8601]. This header specifies the end of validity time of the directory – after the validity time has passed, the configuration client MUST consider the configuration as invalid and should attempt to download fresh configuration. In addition, the header-only entry SHOULD include the header Version which identifies the version of the configuration (section 2.7). The directory contains references to the individual configuration files. In addition to download URI, each directory item contains hash of the file that can be used to verify integrity of the downloaded file. Hash-algorithm-id – identifies the hash algorithm used to create the content of the directory item. This specification supports algorithm identifiers listed in XML Signature specification [XMLDSIG], Section 6.2. The content of a directory part MUST be digest of the configuration part. The digest algorithm is specified in the Hash-algorithm-id MIME header. The input to the digest calculation is body of the file that can be downloaded from the URL specified in the Content-location MIME header. Annex A.2 contains an example of a signed directory. This specification defines the following content identifiers. The X-Road implementations are free to define additional types of configuration parts that are distributed to configuration clients. PRIVATE-PARAMETERS – XML file conforming to private-parameters.xsd (see Annex C ). SHARED-PARAMETERS – XML file conforming to shared-parameters.xsd (see Annex B ). The configuration source can distribute several files of type SHARED-PARAMETERS. In this case each of the shared parameters files MUST describe separate X-Road instance. A configuration client can download the configuration by making HTTP GET requests to the configuration source. To download and verify the entire configuration, the client can follow these steps. Parse the configuration anchor and read the download URI (pointing to the configuration directory) and the verification certificate. Download the configuration directory from the URI and parse it. Verify the signature of the configuration directory using the public key of the verification certificate. The signature algorithm identifier is specified by the MIME header Signature-algorithm-id of the MIME part containing the signature. verify the integrity of the downloaded file by comparing the hash of the file with the hash contained in the directory (the hash algorithm is specified in MIME header Hash-algorithm-id). For each configuration anchor in the private parameters file, download and verify the configuration using this set of rules. The current version of the configuration is 2. Configuration source MAY support several versions of the configuration. The configuration client SHOULD signal the version it supports by appending a "version" query parameter in the download URI specified in the configuration anchor. The version number is an integer which is incremented when a backwards-incompatible change is made to the PRIVATE-PARAMETERS or SHARED-PARAMETERS configuration part. For backwards compatibility, the configuration source MAY return a default version of the configuration if the version query parameter is not present. The configuration source MUST respond with HTTP error code 404 (Not Found) if the client requests a version that is not available. The protocol described in the previous section can be deployed in various ways. In particular, the difference is how the Governing Authority distributes several configuration parts between configuration sources and how the configuration from the federated X-Road instances is distributed to the members. This scenario involves a standalone X-Road instance that is not federated with any other X‑Road instances. In this case, the simplest configuration involves one configuration source that distributes all the necessary configuration. optionally any additional configuration parts that are specific to this X-Road installation. Monitoring parameters belong to this category. Because the shared parameters are distributed in the main configuration, the private parameters part does not contain any additional configuration sources. This scenario involves a standalone X-Road instance that uses different configuration sources for private and shared parameters. In this case the X-Road governing authority manages two configuration sources. The first source contains the private parameters and, optionally, other configuration parts that are specific to this X-Road instance. The second source contains shared parameters. 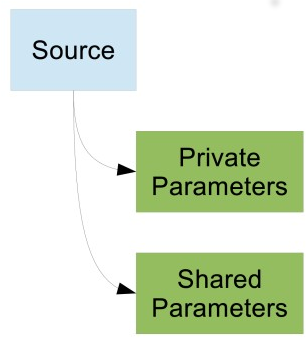 The private parameters part contains anchor for the second configuration source. Figure below illustrates this situation. Compared to the simplest case, the configuration authority must maintain two separate configuration sources. Additionally, the configuration clients must make additional HTTP requests to download the directory from Source 2. For a non-federated installation, this solution does not offer significant benefits, but it is a good starting point for building a federated X-Road infrastructure. This scenario involves two federated X-Road installations. Both installations are set up according to "Detached Shared Parameters". Figure below describes the setup. Both X-Road installations maintain two configuration sources, one for private parameters, the other one for shared parameters. For both installations, the private parameters part contains configuration anchors for both of the sources that distribute shared parameters. Members of the X-Road installations are initialized with configuration anchor pointing to private configuration source of their governing installation. This source is then used to download private parameters that contains configuration anchors for the sources that distribute shared parameters. Scenario from the simple federated installation can be further developed by using configuration proxies. The figure below shows a setup where one X-Road installation uses proxies to cache both the incoming and outgoing shared parameters. Proxy is configured with a configuration anchor and it downloads and caches configuration from the source described by the anchor. Additionally, proxy acts as a configuration source and allows clients to download the cached configuration. Instead of direct references from private parameters of one installation to shared configuration source of the other installation, the X-Road installation 2 sets up two proxies. Proxy 1 downloads shared parameters of X-Road installation 2 and redistributes them to other X-Road installations. Proxy 2 downloads shared parameters of another X-Road installation (1 in this example) and distributes them to members of X-Road installation 2. In this setup, the X-Road 2 has complete control over configuration that is exchanged with other X-Road installations – both incoming and outgoing. Using a proxy can improve availability of the shared parameters and reduce load on shared configuration sources of both X-Road installations. In addition, the proxies can transform the configuration, e.g. by filtering out some member classes. However, the filtering should be declared in the federation agreement to avoid any confusion among the members of the federated X-Road installations. This example directory contains two parts. The first part contains private parameters and the second part contains shared parameters. settings used in this X-Road instance. <documentation> Member class of the member. member within the given member class. or provider in the X-Road system. responsible for the security server. certificate used by the security server. Fully qualified class name implementing the ee.ria.xroad.common.certificateprofile.CertificateProfileInfoProvider interface. group within an X-Road instance. <documentation> Description of the group. a subsystem belonging to this group. <documentation> Information about an OCSP provider. <documentation> URL of the OSCP server. server to sign OCSP responses. authority, used in user interfaces. <documentation> URL of the time-stamping service. time-stamping server to sign responses. <documentation> The CA certificate value. member class in this X-Road instance. <documentation> Description of the member class. central service in this X-Road instance. seconds, it is no longer valid. used only by members of this X-Road instance. called by the security servers. Configuration parameters that define how distributed central monitoring works. Monitoring client, which is athorized to query monitoring data from all security servers. Identifier of the X-Road member or subsystem which is athorized to query monitoring data from all security servers.